My Wandering Life: Please and Thank You! Our lawn is an exotic mixture of weeds. Which according to our lease agreement must be kept watered. 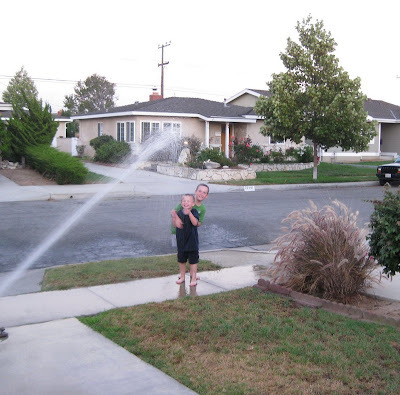 We water it, and then the gardener puts weed killer on it and it turns brown. So we water it some more and it turns green just in time for the gardener to put more weed killer on it... you get the idea. I don't play the "If we owned this place I'd__________" game any more because we know our time here is limited (110 days! 15 weeks!). 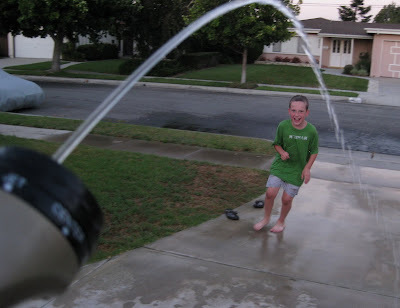 So I just water the lawn. Without fail, the boys hear the sound of running water and they come running! 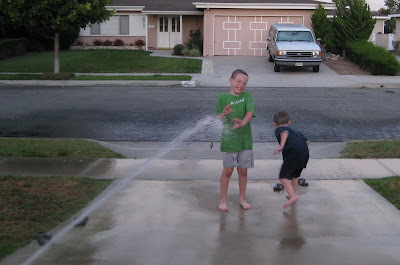 Tonight it was about dusk and rapidly cooling off when I walked outside and picked up the hose. And out they came, wanting a turn watering the grass. I said, "Say please!" and when they did, I sprayed them down, fully dressed, much to their unexpected delight! Then it became a game. They ran up and down the sidewalk yelling "Please!" and "Thank you!" at the top of their lungs while I aimed at them like the carnival game at the fair. Hopefully the neighbors think that my kids are just exceptionally polite. I did give them a nice warm bath when they were finally shivering, turning blue, and had audible chattering of teeth (but still begging for more!). As you can see, the street got watered quite nicely. The lawn, not so much. Tomorrow is another day!